People across B.C. are donning pink to combat bullying, but a Simon Fraser University expert says Pink Shirt Day means little if the root cause of bullying isn't addressed. 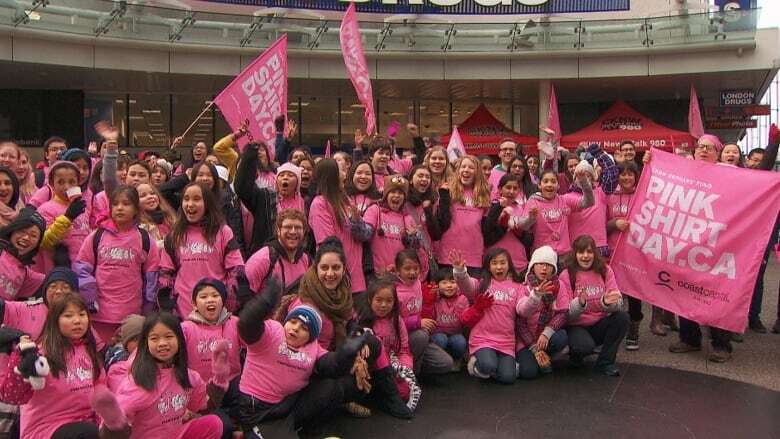 People throughout British Columbia marked Pink Shirt Day by donning pink on Wednesday, but a Simon Fraser University expert says the annual event means little if the root causes of bullying aren't addressed. "It's one thing for a school to say we have a bullying program, therefore we've solved the bullying problem," Wanda Cassidy, an associate professor at SFU's Faculty of Education told B.C. Almanac's Gloria Macarenko. "It's another issue to actually look at what's really going on in our schools, away from the eyes of parents and of teachers, and seeing how those issues are being addressed at a deep level." Pink Shirt Day was started in Nova Scotia in 2007, when two boys wore pink in solidarity with other students who were being bullied for wearing the colour at their school. Since then, students across Canada and the world have taken part in the annual day, to wear pink and help to prevent bullying and cyberbullying. When it comes to preventing bullying, Cassidy says educators and parents need to realize that it's not effective to simply punish a bully — they must get to the bottom of why bullying is happening in the first place. "Is it adolescence? Is it trying to position yourself in a group in a more hierarchical way?" Cassidy said. "In some of our research, we find that students say that it's fun. Those types of issues need to be dealt with in a more effective way." Kevin Smith, principal of a North Vancouver elementary school, agrees that combating bullying is less about consequences and more about building relationships. "It's about, from an early age, talking to children about love for one another, and our relationships and how to solve problems," he said. "And I think that comes through in social, emotional learning curriculums in our school and responding to kids, teaching kids how to respond to each other." In 2012, B.C. Premier Christy Clark introduced a 10-point bullying strategy following the death of Amanda Todd, the 15-year-old girl who committed suicide after posting a YouTube video describing how she was tormented by bullies. On Wednesday, as part of the ongoing anti-bullying strategy, the government rolled out new social media guidelines to better help children, teachers and parents, developed by a group of 20 students from all over the province. To listen to the full interview with Wanda Cassidy, click on the audio labelled: Education expert says deeper discussions about anti-bullying needed. #PinkShirtDay seeks to raise awareness, end bullying in N.L.